Friendly and welcoming staff greet you on arrival at Moksha — it means a state of release from the cycle of death and rebirth in Hindu philosophy — where your stay in one of the tranquil rooms is likely to be an excellent one. 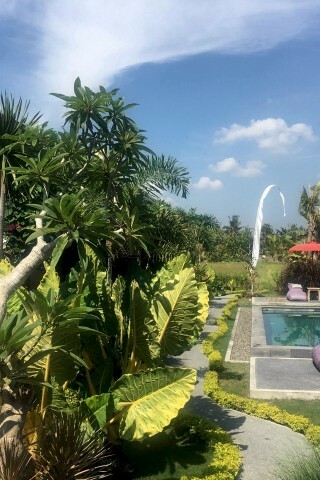 Entry is via a modern open-air cafe beyond which you could believe you’re in the middle of nowhere, as a short path leads to a small inviting pool then continues to the rice fields and river below. Four contemporary glass-fronted rooms overlook a pool and immaculate small garden in a single low-rise block. The large air-con rooms are simple and stylish with a fresh, modern-Asian ambience. Rooms are furnished with white-washed wooden furniture and interesting photographs grace the walls. Pristine, polished tiled flooring is cool underfoot. Beds are large and comfortable, with crisp white sheets. A comfy sofa-bed can be used at no extra charge, meaning it’s good value for flashpackers with kids. Flat screen TVs and free WiFi are part of the deal. Ensuite bathrooms have a small tub and separate rain-shower and are open, but not quite outdoor style. There is plenty of natural light and air, yet they still remain private. Black volcanic tiles and pebbled floors with white walls adds to the contemporary tone, however the plastic shower curtain seems out of place. Soak up the tranquility on beanbag lounges on the small open balcony, or move a couple of more metres to one under one of the traditional temple umbrellas beside the pool. The included breakfast can be served on the balcony, or in the small restaurant area. If you must leave these serene surroundings, The Moksha offers a free shuttle service to Ubud. In the evening enjoy the symphony of frogs and crickets in the adjoining paddy. True to its name, The Moksha is a little hard to find — it’s near the back of Honeymoon Guesthouse’s extension, and accessed from a lane off Jalan Bisma. Staff will help if you’re lost. Check rates at The Moksha on Booking.com.